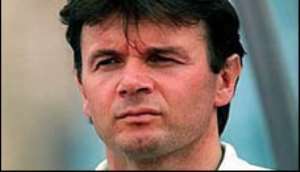 Frenchman Phillipe Troussier has admitted he is interested in taking up Ghana's vacant managerial post. The former South Africa and Nigeria coach told the Accra-based radio station JoyFM he is in an advanced stage of talks with the Ghana Football Association (GFA). "I am in negotiations with the GFA and I think the final decision will be taken at the end of this week or the beginning of next," he said. "Right now, nothing is decided." Troussier, who has coached in the Ivory Coast, Japan and Qatar as well as in Nigeria and South Africa, said he was interested in the Black Stars job because of the size of the "challenge". "I am very interested in the mission," he explained. "I know the level of football in Ghana because of the time I spent in the Ivory Coast. "It is a big challenge for me and a big challenge for Ghana because of the possibility of qualifying for the World Cup." The chance to manage Ghana, who have won the African Cup of Nations four times yet never qualified for the World Cup finals, arose after Portuguese coach Mariano Barreto quit the post in September. Although the GFA has made Troussier its number one target, Ghanaian officials face competition from Wales whose Football Association has also been considering the Frenchman as the country's future manager. Troussier said he has not ruled out the Welsh option. "I am considering Ghana but of course, I am also in discussion with the Welsh FA," he said. "That's also a good challenge because it is a possibility for me to get back into Europe which is one of my priorities after more than fifteen years away. So nothing is decided. "The people at the GFA seem very motivated to give me the job. "Everything is on track at the moment but I need time to study the offer seriously and make a decision."